It was a little taste of heaven as ethnic Grace Brethren pastors met September 13-16, 2011, in the Southwest to discuss U.S. church planting among their people groups. Gathering first at Native New Life Church (Arnold Betoney, pastor), a Grace Brethren congregation in the International District of Albuquerque, representatives of Haitian, Hispanic, Indian, Chinese, and Albanian ministries spent time in prayer for their various ministries. 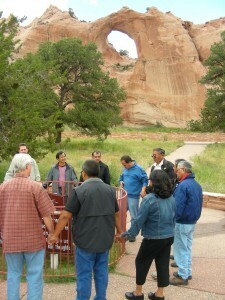 Then they moved on to Window Rock, Ariz., the capital of the Navajo Nation, for two more days of meetings. The week included devotions led by Steve Galegor, Jr., who works with Albanian immigrants in Clifton, N.J.; Dumont Cardichon, a Haitian pastor who oversees church planting in the Florida Haitian community; and Kevin Ong, director of the International House in San Francisco, Calif. The pastors brainstormed how to best work together to reach people for Christ and how to communicate their mission to the rest of the Fellowship of Grace Brethren Churches. On one break, they drove a short distance to the rock formation for which Window Rock has been named. Nelson Betoney, father of Pastor Arnold Betoney, told about the Navajo Code Talkers of World War II and the history and traditions of the Navajo people.